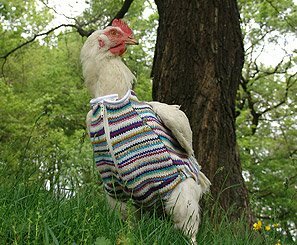 I would be scared to try and put a sweater on a chicken. Now I have seen almost everything. I love stylish chickens. Chickens this week, turkeys next time. LOL, that's one stylin' chicken! Ok, one chicken tame enough to dress, I could understand. But more? and Why?? let's decide the chickens just love all the attention--and the chance for dress-up. all the hens, that is. a little red hen lives at my blog.